DUNDEEL (NZ) (Bay 2009-Stud 2014). Horse of the Year in NZ in 2013-14. Champion 3YO in NZ in 2012-13. Champion Middle Distance Male in Australia & NZ in 2013-14. 10 wins-1 at 2-from 1200m to 2400m, Australian Derby, Gr.1, ATC Queen Elizabeth S., Gr.1, Spring Champion S., Gr.1, Randwick Guineas, Gr.1, Rosehill Guineas, Gr.1, MRC Underwood S., Gr.1. Half-brother to SP Twoeezy. Sire of SW Irukandji (ATC Schweppervescence H., Gr.3) and of Atyaab, Cutadeel, Dealmaker and of the placegetters Sunreel, The Inevitable, etc. His oldest progeny are 2YOs. PETWORTH HOUSE, by Encosta de Lago. Winner at 2 in Aust. Half-sister to THEANSWERMYFRIEND. This is her second foal. Her first foal is unraced. THEANSWERMYFRIEND (High Chaparral). 4 wins at 1400m, 1600m, A$319,120, to 2017-18, VRC Sofitel H., L, Greg Miles Trophy, MRC Thebigscreencompany.com H., Ladbrokes Odds Boost H., 2d ATC Carbine Club S., Gr.3, VRC March S., L, Saintly H., MRC Beveridge Williams H., Hockingstuart H.
Quartermaster. 7 wins from 1600m to 2600m, A$151,840, to 2016-17 in Aust. War Piglet. Winner at 2000m in 2017-18 in Aust. Our Freebie. Winner at 1400m in 2017-18 in Aust. Petworth House. Winner. See above. LATIN LOVE (Danehill Dancer). 3 wins-1 at 2-at 1m, 9f, €112,207, US$58,176, Cork Platinum S., L, Curragh Kilboy Estate S., L, 2d Woodbine Canadian S., Gr.2, Curragh Dance Design S., Gr.3, Kilboy Estate S., L, 3d Curragh Park Express S., Gr.3, Gowran Park Victor McCalmont Memorial S., L, 4th Curragh Celebration S., L-twice. Producer. Stand to Reason. 6 wins from 1m to 16½f, Newbury Dubai Duty Free Millennium Millionaire H., Sandown Children's Trust H.
Muraabit. 4 wins from 9f to 10½f, Newbury Bathwick Tyres H., York Barkers Garage S.
ROYAL BENCH (Whipper). 7 wins-1 at 2-from 1600m to 4000m, €208,790, US$72,454, HK$3,520,000, 920,000Dhs, Longchamp Prix Daniel Wildenstein, Gr.2, Deauville Prix du Haras de la Huderie, L, Delaware Park Cape Henlopen S., L, Longchamp Prix Machado, Prix du Puits de l'Ermite, 2d Cathay Pacific Hong Kong Mile, Gr.1, 4th Meydan Dubai Duty Free S., Gr.1, Deauville Prix Jacques Le Marois, Gr.1. MAYHEM (Whipper). 5 wins from 1850m to 2400m, €188,270, Chantilly Prix Allez France, Gr.3, Saint-Cloud Prix Joubert, L, 2d Longchamp Prix de Royallieu, Gr.2, 3d Saint-Cloud Prix Corrida, Gr.2. MEMPHIS TENNESSEE (Hurricane Run). 2 wins-1 at 2-at 1m, 13½f, £110,842, €136,285, Chester Ormonde S., Gr.3, 2d Leopardstown Derrinstown Stud Derby Trial S., Gr.2, 3d Irish Derby, Gr.1, 4th The Derby, Gr.1. NELSON (Frankel). 3 wins-2 at 2-from 1m to 1¼m, £43,020, €109,523, to 2018, Leopardstown Champions Juvenile S., Gr.3, Ballysax S., Gr.3, 2d Newmarket Royal Lodge S., Gr.2, 3d Royal Ascot Queen's Vase, Gr.2. US ARMY RANGER (Galileo). 2 wins at 1¼m, 12½f, £398,289, €37,495, Chester Vase, Gr.3, 2d The Derby, Gr.1, Chester Ormonde S., Gr.3, Leopardstown Kilternan S., Gr.3. NEVIS (Dansili). 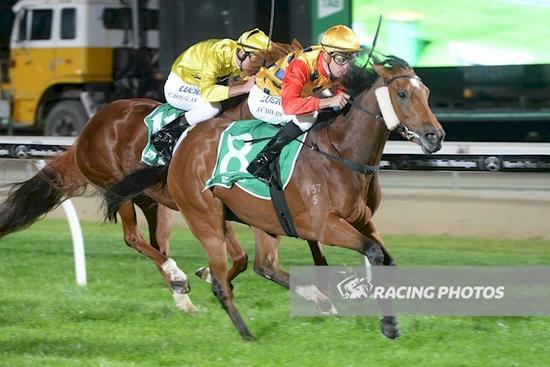 5 wins-1 at 2-at 1600m, 2300m, £35,520, €14,125, A$176,060, Bendigo JC Yalumba Golden Mile, L, Lingfield Derby Trial S., L.
STUBBS (Danehill Dancer). 3 wins-2 at 2-to 1500m in Ireland and Denmark, Naas Rochestown S., L, 3d Doncaster S., L.
CHAMONIX (Galileo). 3 wins at 1½m, 1¾m, Listowel S., L, Galway Oyster S., L.
MAGIC CIRCLE (Makfi). 8 wins from 1½m to 18¾f, £224,290, €9,000, to 2018, Sandown Henry II S., Gr.3, Chester Cup, Newmarket Adnams Blackshore Stout H., York Fine Equinity H.
Demurely (Galileo). Winner at 11¼f, 2d Cork Give Thanks S., Gr.3, Listowel S., L, Galway Oyster S., L. Producer. NANTYGLO (Mark of Esteem). 2 wins-1 at 2-at 6f, 1m, Goodwood Conqueror S., L, 3d Newbury Mill Reef S., Gr.2. Producer.